I’ve never been to a brewpub where I could get fries cooked in duck fat to snack on while sipping a beer flight, but this is possible at Bull City Burger & Brewery in downtown Durham, N.C. While crunching away on the shoestring fries, the Hub and I sampled eight of the nine beers currently offered (remember, y’all, we don’t do IPAs). I was first struck by how little aroma there was to the beers – except for the Capt. Hee-Haw American Style Peach Wheat Beer, which smacked me in the face with peaches. Unlike some beer fans, I don’t issue blanket condemnations of brews with fruit flavors, but after a few sips of this one, I felt like I was drinking potpourri. Others were Bryant Bridge Gateway Golden Ale, Dr. Bartlett’s Ordinary Bitter, Parrish Street Pale Ale, Liberty Summer Amber Ale, Rogers Lager and Pro Bono Publico Porter, plus hsaWaknoW Ale that included cacao nibs from Elemental Chocolate in Raleigh, N.C. (The name is Wonka Wash spelled backwards.) Bull City provides an excellent sheet of information on their beers which includes the types of hops used in each. And I learned how the city of Durham got its name, so it was an educational day all around. On the back are beer-related witticisms. My favorites were the bitter, porter and chocolate ale. I liked the amber ale more as it got a little warm. The mild chocolate flavor of the chocolate ale would likely accent the chocolate in cakes or frosting, if used in baking. The porter had a nice coffee flavor and it would make a good ingredient in a meat marinade. The bitter would play well with most foods. beer at mother earth brewing, kinston n.c. The Hub and I used the Southern Foodways Alliance BBQ Field Trip as an excuse to finally visit Mother Earth Brewing in Kinston, N.C. I’ve enjoyed the brewery’s Weeping Willow Wit at spots around Raleigh and was interested in tasting more. We had 90 minutes to kill between one meal and another. Hey, SFA, if someone had asked me, I would have told you there was nothing to do in downtown Kinston on Saturday afternoon except hit the brewery. So nearly 100 thirsty food fans poured in. The lone bartender was slammed but good natured. We ordered a tasting flight. “You want all of them?” he said. You bet, we answered. That meant six on the regular printed card with little spaces for the glasses, plus four on the bar to the side. This could be a really short post: I liked them all. Except the Sisters of the Moon IPA, of course. IPAs and I do not play well together. I handed that sample to @DurhamFoodie to help her wash down the ears of corn she snarfed at lunch. The samples included both a conventional on-tap version of Dark Cloud, a Munich-style dunkel lager, and a nitro pour version, and it was interesting to compare the two. When nitrogen is introduced, the beer typically becomes less carbonated in texture and less acidic in flavor. I certainly noticed both qualities – the beer was as smooth and soft as water, but with a whole lot more flavor. We also compared the conventional and cask-conditioned versions of Second Wind, a pale ale. Cask conditioning is a process in which a beer retains yeast for a secondary fermentation in a cask in the brewery. The beers are usually unfiltered. The difference in mouthfeel was striking, with the cask-conditioned version being ultra smooth. The Hub thought a stout using cocoa nibs from Raleigh’s Videri Chocolate Factory in Raleigh, N.C. might be too heavy for a hot June day, but he quickly admitted his error. 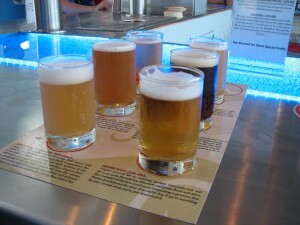 The brews change frequently as the brewers experiment and explore flavors. If it wasn’t a 90-minute drive, I’d hop over there regularly to see what’s on tap. Although the taproom doesn’t serve food, it was recently announced that Mother Earth will team up with Chef & the Farmer to open an oyster bar this fall. The Big Boss taproom looked like the kind of place where I shared pitchers of light beer in college: Dark, lots of black wood, TV over the non-nonsense bar, old sofas and armchairs in adjoining rooms. If the TV had been showing “Monty Python and the Holy Grail,” I would have been completely transported back to the end of finals – except that the draft offerings were much, much better. The brewery and taproom is located at the end of an industrial street, but don’t let that throw you. Food trucks often park outside to feed thirsty patrons. When we went, it was American Meltdown, which offered creative grilled cheese sandwiches (unfortunately for the dairy-allergic Hub) and flavored iced teas. I’ve sampled Big Boss’ bottled beers many times, so I went for the specials, Saucey Pants, Monkey Bizz-Ness and V for Victory, with Blanco Diablo, which is available in bottles but I’ve found sometimes difficult to locate. For me, V for Victory, described as a Vienna-style beer, had a medicinal flavor. Not my favorite. Monkey Bizz-Ness, a Belgian-style ale, grew on me more and more as the beer got a little warmer. I would like to see Saucey Pants, a saison, paired with food because of its intricate flavors. That would be interesting. I always love a witbier, so Blanco Diablo was a no-brainer. The genial tap-master knew how to lay out a flight in the retro metal holders, and wrote the names of the beer on them with an orange Sharpie. It was a pleasant trip back in time, with much improved beverages. Aristotle discussed it and Danish warriors in “Beowulf” quaffed it, but is mead beer or wine? At Starrlight Meadery in Pittsboro, N.C., it’s considered wine, although during the thousands of years that mead has been produced the definition has gone both ways. The Hub and I learned in our tour of Starrlight that mead is made from honey, water and yeast (in this case, a winemakers’ yeast). All the honey comes from North Carolina sources, and the meadery needs a lot of it: It takes 60 pounds of honey to produce one 265-gallon tank of mead. The mixture ferments for two to four months, depending on the sweetness desired in the final product. The resulting mead has similar alcohol content to wine, 12 to 13 percent, and should be handled and stored like wine. The honey used gives distinctive qualities to the mead produced because the flavor of honey varies depending on what flowers the bees visit and the time of year. Blending the honeys is an art. Starrlight’s flavored meads use concentrates ordered commercially. We were not sure we’d like any of the seven meads Starrlight makes. Mead is made from honey, after all, and we are not fans of sweet wine. We were surprised. They are not syrupy sweet. Now, if your favorite wine is a big dry Cab, don’t bother. But if you’re open to softer wines, mead offers something different. We tasted (for $5 and you get to keep the glass) Traditional Mead – Off Dry, Off-Dry Blackberry Mead, Traditional Mead – Semi-sweet, Semi-sweet Blackberry Mead, Spiced Apple Mead and Meadjitos, a semi-sweet mead flavored with mint and lime. The traditional meads were our least favorites. Although they had wonderful aromas, like a field of flowers, the bitter edge that honey has came through, to me. The Off-Dry Blackberry is designed to resemble a red wine and smelled like a sherry. The Semi-sweet Blackberry was thicker, like a port, and it could be served in similar situations. Two of our favorites were the apple and Meadjitos. The apple would be great warmed as a mulled wine or combined with hot cider, or cooked into a sauce. I could see the Meadjitos, created to taste like mojitos, over ice on a hot day or mixed with cold seltzer. The meadery was out of the Sweet Peach when we visited; we were told it has been a favorite. More about the meadery is here. Tours and tastings are offered each weekend, and the shop has medieval-style tankards for quaffing at home, if you are low on dragon-decorated chalices. The Hub and I carry the GPS every time we venture into Durham, N.C. In the 20-some years we’ve lived in Raleigh, N.C., we get lost most times that we hit the city limits. Maybe it’s the UNC bumper sticker that makes the car want to veer away in terror from the Land of the Evil Empire. But Garmina did her job well in locating Fullsteam, which is in a brick warehouse down a side street in downtown. Fullsteam has an interesting concept: Its beers aren’t just locally produced, but use as must locally produced ingredients as brewers can get their hands on. North Carolina-grown sweet potatoes, local grits and chocolate nibs from Escazu Chocolates in Raleigh find their way into beers. Brewers send out calls for such things as pears and persimmons for the Forager series and use whatever shows up. The Hub and I sampled four beers: Carver, the sweet potato beer; El Toro Cream Ale, brewed using grits; Fullsteam Southern Lager; and Summer Basil Farmhouse Ale, brewed with six pounds of fresh basil in each batch. Neither of us expected to like Summer Basil. The idea sounded too much like sticking a lime wedge in a bottle of Corona, which ruins the flavor of the lime. Surprisingly, it was our favorite of the four. The beer was light and refreshing, with a mild, but definite, basil flavor and aroma. Our environment may have contributed to our preference. It was 97 degrees the day we visited, and only the small bar area is air conditioned. It was packed for obvious reasons. We had to sit in the large warehouse area, with fans pushing the overheated air that came through open doors. No AC. Be warned. We also had to drink fast before our beers vaporized. Carver was our second favorite. It does not taste like Grandma’s Thanksgiving sweet potato casserole – the beer isn’t spiced. The beer has a rich red color and an earthy note to the flavor, both from the potatoes. I have had this beer before and didn’t like it at that time because it seemed bitter. I wonder if the beer had been mishandled in that location, because I didn’t detect that bitterness in the beer I sampled at the brewery. That’s the thing about craft beers – handling can make a difference. 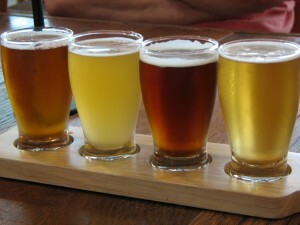 So, if you want to really know what a particular beer tastes like, sample it where it’s made. We had split opinions on the other two. The El Toro had more sweetness, so The Hub liked it more than I did. I thought the Southern Lager had a good balance of bitter and sweet, but wasn’t as interesting to me as the Summer Basil and Carver. Beer Run: Natty Greene’s Pub & Brewing Co. Visiting Natty Greene’s in Raleigh, N.C. feels like taking that fifth-grade field trip to Williamsburg, but with much better refreshments. Quotes from Revolutionary War figures George Washington, Alexander Hamilton, John Hancock and others are written on the walls. And, of course, there’s a biography of the pub’s inspiration, Gen. Nathaniel Greene. Greensboro, N.C., where the brewery is based, was named after the general some years after he routed British forces in the Battle of Guilford Courthouse in 1781. OK, put the elementary schoolers back on the activity bus – it’s time for beer. Natty Greene’s current beer menu includes seven year-round offerings plus eight seasonal quaffs. Most have suitably colonial names, like Stamp Act Spring Rye and Black Powder Imperial Stout. The pub doesn’t offer a tasting flight per se, but you can make your own by ordering taster-size glasses of anything on tap for $1.50 each. Three of the seasonals were unavailable when The Hub and I visited. I ordered Hessian Hefe-weizen, Wildflower Witbier and Old Town Brown. The Hub got Guilford Golden Ale, Smoothbore Amber Mild Ale and Sir Walter’s ESB. Guilford, Wildflower and Old Town are available year round. The biggest surprise for both of us was the Wildflower. The Belgian-style white beer is flavored with coriander, chamomile and orange peel – and it smelled like a perfume counter. But it had only a light floral aftertaste, not nearly as strong as it smelled. The flavor was refreshing, with some grassy notes. However, my food (a spinach salad with batter-dipped fried chicken strips, bacon and mustard vinaigrette) overwhelmed it. But on a warm day on a patio…primo. My Hessian Hefe-weizen was complex in flavor, with clove and banana aromas and a slight, refreshing bitterness. I could definitely taste the advertised “hint of baker’s chocolate” in the Old Town Brown, along with the toasted malt. I fantasized about how this beer could be paired with a dessert, or used in a dessert. The Hub is a fan of ESBs, and Sir Walter’s did not disappoint him. It was sweet and smooth. The Smoothbore Amber Mild Ale was correctly described as having a “slight caramel flavor up front, followed by just enough hoppy bitterness.” It reminded The Hub of one of his preferred commercial beers, Bass, but better. The only bust: Guilford Golden Ale. It reminded both of us of (fill in your average pale gold flavorless mass-marketed beer here). All I can say is, it’s about time. Wine snobs have had their phone apps practically since the first iPhone dropped. Now, beer fans have a choice of several apps that will help them find their favorite craft brews, match beer to food and locate pubs. The New York Times has a rundown of the offerings here. Some of the apps are limited – one, BeerCloud, only covers eight states. The hub and I had been hearing about Asheville, N.C.’s microbreweries. There are around 10 in downtown and the immediate area, including Pisgah Brewing Company in Black Mountain, N.C., which produces all certified organic beers. The mountain city and its environs is considered by some to be the second-best spot for craft brews after Seattle. Beers from the oldest and largest brewery, Highland Brewing, can be found in the Triangle, but others are limited to the western part of the state. We signed up for a Brews Cruise group tour, but it was a slow week and not enough people signed up to make it go. So we struck out on our own. There were five within walking distance downtown, and we started with Asheville Brewing Company. 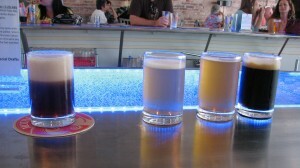 The flight was Rocket Girl Lager, Stuntman Ale, Escape Artist ESP, Roland ESB and Ninja Porter. Rocket Girl had a lot of flavor for a lager, but my favorites were the ESB and porter, especially since I have a low tolerance for hops. The ESB was fragrant and complex, but the porter really gave me something to contemplate with chocolate, coffee and tobacco flavors. It wasn’t as heavy as some porters, which was good, since we had other brews to quaff. We walked into Jack of the Wood two minutes after it opened. In my prime, I closed down many an establishment, but it was the first time I’d opened one. We sampled three Green Man brews there: porter, ESB and a cask-conditioned IPA that required hand pumping. One advantage of arriving in mid-afternoon: The very knowledgeable bartender had plenty of time to talk to us. I didn’t think I’d like the IPA (the hops thing), and I didn’t, but it was certainly interesting. The ESB had a floral flavor, and the rich porter would be fun to cook with, which they do at Jack of the Wood. We pressed on to one of the newer breweries, Lexington Avenue Brewery, where they set a flight of seven beers before us. The hub and I thought all seven were sweeter than others we’d had, but that’s not necessarily a bad thing – it meant the IPA wasn’t as bitter as most. The white ale had no bitterness at all and was really different in its light flavor. I thought the hefeweizen was a bit too sweet and perfumy; I had trouble detecting the wheat flavor. Others in the flight, American pale ale and Octoberfest, were good. But I guess we must be fans of the dark side, because the dunkelweiss and chocolate stout were most intriguing to me. The stout includes chocolate extract, and had a roasty-toasty flavor. The dunkelweizen had hints of cherry and roasted spice. I could imagine both of those flavoring a devil’s food cake. We hit the wall right about then, so we didn’t make it to Craggie Brewing or OysterHouse Brewing, which offers a beer brewed using oysters. Shell and all. Keep up with the mountain beer scene with the Beer Guy in the Asheville Citizen-Times. We will need some time to recover before making another run. We can’t research like we used to. I’m looking forward to the opening of Fullsteam Brewery’s tasting room in Durham, N.C. on Aug. 13. I like the brewery’s commitment to using local products in different ways, such as incorporating scuppernongs and other local flavors, plus working with projects to grow hops in the state. Until the tasting room opens, mere mortals have had to be alert for locations serving the beer, which was the case at Busy Bee Cafe in Raleigh this week. The hub and I went to sample the Carver Sweet Potato Lager (yes, sweet potatoes) and Summer Basil Farmhouse Ale. I think I tasted the sweet potato lager before, at a Southern Foodways Alliance event, but the beer I had this week was different from what I remember. It tasted quite hoppy and bitter, and neither of us could detect a sweet potato flavor per se, but the beer did have a rich, deep red color. I don’t care for extremely hoppy beers, so that was not to my liking. The hub thought he detected more sweet potato flavor as the beer got warmer. The Summer Basil, however, had just a hint of the herb, refreshing without being overpowering. I wondered how it would stand up to food, and it did well with our dinner of calamari, tuna with Israeli couscous and even the hub’s steak frites. Fullsteam’s brew-local philosophy is exciting and different for this area. I hope the beers live up to the ideals. It’s the middle of summer. It’s hot. The kids are already driving you nuts. No better time to drink some great beer for a good cause. Aviator Brewing Company in Fuquay-Varina, N.C. is holding a Music Fest and Gulf Oil Spill Fundraiser on Saturday, July 17. Two local bands will perform. New beers will be on tap, including a special black Belgian India Pale Ale named Black Horizon that will be sold to raise money for the Florida Aquarium’s clean-up efforts. And – everyone cross their fingers – the day also might be a celebration that the gusher is finally capped. The event will run from 3 p.m. to 9 p.m. at the brewery, 209 Technology Park Lane, Fuquay-Varina, N.C. 27526. For more information, visit here. Rumor has it that Aviator will begin bottling its beer soon. That means I won’t have to drink an entire growler when I open it (it’s a shame to waste beer).